Video clips of alleged ‘Russian airstrikes, firing squads, other staged violence scenes’ in Aleppo were fabricated by militants, the Russian Defense Ministry said Tuesday. The UN claimed earlier it had evidence that Syrian government troops had been going door to door in the besieged city, killing 82 people, as rebel resistance crumbles. “All Western statements with reference to ‘posts of activists’ and movies about alleged ‘Russian airstrikes’, ‘firing squads’ and other staged scenes were filmed by special TV groups comprised of militants. It remains a big question why some media used it without checking the source. Some advice — do not believe the propaganda of the terrorists,” Russian Defense Ministry spokesman Maj. Gen. Igor Konashenkov said. Meanwhile, all Russia’s calls to the West and international organizations to send promised humanitarian aid to the Syrian civilians who left Aleppo remained unanswered, Konashenkov added. “All our appeals to our Western counterparts and international organizations to send humanitarian aid, they promised to deliver to the civilians who were able to escape Aleppo remained unanswered,” the Russian Defense Ministry spokesman told journalists. According to Konashenkov, the international community prefers to keep silent and use security threat excuses instead of helping the Syrians. “However, earlier, no-one in London, Paris, Berlin and Washington was scared by delivering aid to the areas controlled by terrorists in eastern Aleppo,” Konashenkov said. Earlier in the day, the Russian reconciliation center said that the Syrian authorities are controlling over 98 percent of the territory of Aleppo, militants are present in less than 3 square kilometers (1.1 square mile). “In the past 24 hours, 11 more districts of eastern Aleppo were freed from terrorists. 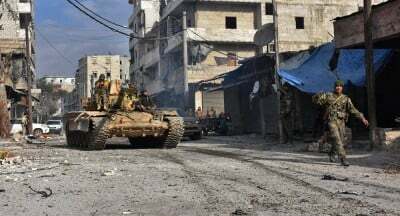 Therefore, the Syrian authorities are controlling more than 98 percent of the territory of the city of Aleppo, while the total area of the eastern part of the city where militants remain does not exceed 3 square kilometers,” the center said in a statement. According to the center, some 110,000 civilians, including 44,00 children have been evacuated since the beginning of the Syrian offensive to liberate the city. More than 7,000 people have returned to their homes.